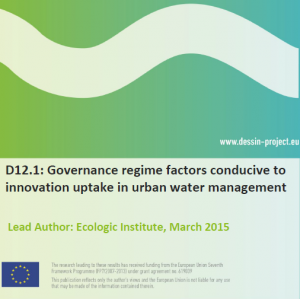 This Deliverable reports the results of the assessment of governance factors conducive to innovation uptake carried within the context of the FP7 DESSIN project. The research is based on the analysis of innovation uptake in the three DESSIN mature case-study sites (i.e. Aarhus, Emscher, Ebro) which had welcomed some successful transformation in urban water management. A number of recommendations are presented in the conclusion to inspire future “entrepreneurs” in promoting innovation uptake in urban water management.